A charming gift basket topped with an elegant red ribbon, which will make a delicious surprise for anyone! 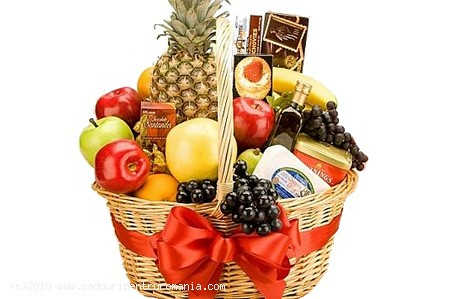 About the gift designs Send Gifts to Romania online store: all our gifts have a unique design: the fruit baskets are topped with luxury ribbons, the flowers are delicately wrapped. Send Gifts To Romania constantly works with specialists who come up with new design ideas. Send Gifts To Romania assures you of the quality of each gift and flower delivery to Romania. Choose Send Gifts To Romania for all your gift and flower delivery needs!